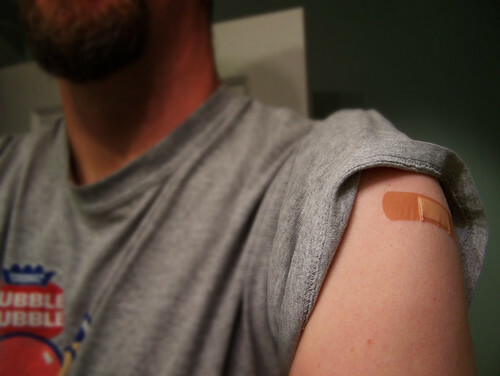 Flu Shot (292/365) – Annoyingly Boring? Flu shots at work tonight. Yay. I wanted to get one of those too, but each time the nurse tried to make the injection the needle either bent right in half or completely shattered. Wow, you got a bandage? I never do. Of course, I get a drive-thu flu shot from the local hospital. Pretty convenient, but apparently no band-aids. Wow, kind of late, isn’t it? I got mine back in September. Flu shots are a scam perpetrated by the conspiracy between insurance companies and Big Brother, meant to keep you docile and subservient. Fight the power! Ouch.. I just got alerted to this little application yesterday.. http://www.google.org/flutrends/ and then saw your picture and it made me think of it again..
Nice guns. I got mine too. Damn that thing hurt the next day. I have never had one of those. And probably won’t get one this year, either. I am a chicken. I notice no one seems to have asked the truly important question here…..did you get a sucker when you were finish. 😉 If not,then man! I think you were gypped.